1 A None No Power Seat 1 A is a standard Premium Class Bulkhead seat. 1 C None No Power Seat 1 C is a standard Premium Class Bulkhead seat. 1 D None No Power Seat 1 D is a standard Premium Class Bulkhead seat. 1 E None No Power Seat 1 E is a standard Premium Class Bulkhead seat. 1 F None No Power Seat 1 F is a standard Premium Class Bulkhead seat. 1 G None No Power Seat 1 G is a standard Premium Class Bulkhead seat. 1 J None No Power Seat 1 J is a standard Premium Class Bulkhead seat. 10 A None No Power Seat 10 A is a standard Economy Class Bulkhead seat. The tray table and TV is in the armrest, making the armrests immovable and slightly reducing seat width. There is no floor storage for this seat during takeoff and landing. 10 B None No Power Seat 10 B is an Economy Class Bulkhead seat that has extra legroom. However, this seat may get bumped into as the bulkhead does not extend fully to the aisle. The proximity to the service station may be bothersome. The tray table is in the armrest, making the armrests immovable and slightly reducing seat width. There is no floor storage for this seat during takeoff and landing. 10 C None No Power Seat 10 C is an Economy Class Bulkhead seat that has extra legroom. However, this seat may get bumped into as the bulkhead does not extend fully to the aisle. The proximity to the service station may be bothersome. The tray table is in the armrest, making the armrests immovable and slightly reducing seat width. There is no floor storage for this seat during takeoff and landing. 10 D None No Power Seat 10 D is an Economy Class Bulkhead seat that may have limited legroom. The proximity to the service station right in front may be bothersome. The tray table is in the armrest, making the armrests immovable and slightly reducing seat width. There is no floor storage for this seat during takeoff and landing. 10 E None No Power Seat 10 E is an Economy Class Bulkhead seat that may have limited legroom. The proximity to the service station right in front may be bothersome. The tray table is in the armrest, making the armrests immovable and slightly reducing seat width. There is no floor storage for this seat during takeoff and landing. 10 F None No Power Seat 10 F is an Economy Class Bulkhead seat that may have limited legroom. The proximity to the service station right in front may be bothersome. The tray table is in the armrest, making the armrests immovable and slightly reducing seat width. There is no floor storage for this seat during takeoff and landing. 10 G None No Power Seat 10 G is an Economy Class Bulkhead seat that has extra legroom. However, this seat may get bumped into as the bulkhead does not extend fully to the aisle. The proximity to the service station may be bothersome. The tray table is in the armrest, making the armrests immovable and slightly reducing seat width. There is no floor storage for this seat during takeoff and landing. 10 H None No Power Seat 10 H is an Economy Class Bulkhead seat that has extra legroom. However, this seat may get bumped into as the bulkhead does not extend fully to the aisle. The proximity to the service station may be bothersome. The tray table is in the armrest, making the armrests immovable and slightly reducing seat width. There is no floor storage for this seat during takeoff and landing. 10 J None No Power Seat 10 J is a standard Economy Class Bulkhead seat. The tray table and TV is in the armrest, making the armrests immovable and slightly reducing seat width. There is no floor storage for this seat during takeoff and landing. 25 C None No Power Seat 25 C is a standard Economy Class seat. However, the proximity to the lavatory may be bothersome. 25 D None No Power Seat 25 D may have limited recline. The proximity to the lavatory may be bothersome. 25 E None No Power Seat 25 E may have limited recline. The proximity to the lavatory may be bothersome. 25 F None No Power Seat 25 F may have limited recline. The proximity to the lavatory may be bothersome. 25 G None No Power Seat 25 G is a standard Economy Class seat. However, the proximity to the lavatory may be bothersome. 26 A None No Power Seat 26 A may have limited recline. The proximity to the lavatory may be bothersome. 26 B None No Power Seat 26 B may have limited recline. The proximity to the lavatory may be bothersome. 26 C None No Power Seat 26 C may have limited recline. The proximity to the lavatory may be bothersome. 26 G None No Power Seat 26 G may have limited recline. The proximity to the lavatory may be bothersome. 26 H None No Power Seat 26 H may have limited recline. The proximity to the lavatory may be bothersome. 26 J None No Power Seat 26 J may have limited recline. The proximity to the lavatory may be bothersome. 30 A None No Power Seat 30 A is a standard Economy Class Bulkhead seat. The tray table is in the armrest, making the armrest immovable and slightly reducing seat width. The seat in front does not recline, giving you more space. 30 B None No Power Seat 30 B is an Economy Class Bulkhead seat that has extra legroom. However, this seat may get bumped into as the bulkhead does not extend fully to the aisle. The proximity to the lavatory may be bothersome. The tray table is in the armrest, making the armrests immovable and slightly reducing seat width. There is no floor storage for this seat during takeoff and landing. 30 C None No Power Seat 30 C is an Economy Class Bulkhead seat that has extra legroom. However, this seat may get bumped into as the bulkhead does not extend fully to the aisle. The proximity to the lavatory may be bothersome. The tray table is in the armrest, making the armrests immovable and slightly reducing seat width. There is no floor storage for this seat during takeoff and landing. 30 D None No Power Seat 30 D is an Economy Class Bulkhead seat that may have limited legroom. The proximity to the lavatory may be bothersome. The tray table is in the armrest, making the armrests immovable and slightly reducing seat width. There is no floor storage for this seat during takeoff and landing. 30 E None No Power Seat 30 E is an Economy Class Bulkhead seat that may have limited legroom. The proximity to the lavatory may be bothersome. The tray table is in the armrest, making the armrests immovable and slightly reducing seat width. There is no floor storage for this seat during takeoff and landing. 30 F None No Power Seat 30 F is an Economy Class Bulkhead seat that may have limited legroom. The proximity to the lavatory may be bothersome. The tray table is in the armrest, making the armrests immovable and slightly reducing seat width. There is no floor storage for this seat during takeoff and landing. 30 G None No Power Seat 30 G is an Economy Class Bulkhead seat that has extra legroom. However, this seat may get bumped into as the bulkhead does not extend fully to the aisle. The proximity to the lavatory may be bothersome. The tray table is in the armrest, making the armrests immovable and slightly reducing seat width. There is no floor storage for this seat during takeoff and landing. 30 H None No Power Seat 30 H is an Economy Class Bulkhead seat that has extra legroom. However, this seat may get bumped into as the bulkhead does not extend fully to the aisle. The proximity to the lavatory may be bothersome. The tray table is in the armrest, making the armrests immovable and slightly reducing seat width. There is no floor storage for this seat during takeoff and landing. 30 J None No Power Seat 30 J is a standard Economy Class Bulkhead seat. The tray table is in the armrest, making the armrest immovable and slightly reducing seat width. The seat in front does not recline, giving you more space. 31 A None No Power Seat 31 A is a standard Economy Class seat that Thomson designates as having extra legroom. An extra surcharge may be required to book this seat. 31 B None No Power Seat 31 B is a standard Economy Class seat that Thomson designates as having extra legroom. An extra surcharge may be required to book this seat. 31 C None No Power Seat 31 C is a standard Economy Class seat that Thomson designates as having extra legroom. An extra surcharge may be required to book this seat. 31 D None No Power Seat 31 D is a standard Economy Class seat that Thomson designates as having extra legroom. An extra surcharge may be required to book this seat. 31 E None No Power Seat 31 E is a standard Economy Class seat that Thomson designates as having extra legroom. An extra surcharge may be required to book this seat. 31 F None No Power Seat 31 F is a standard Economy Class seat that Thomson designates as having extra legroom. An extra surcharge may be required to book this seat. 31 G None No Power Seat 31 G is a standard Economy Class seat that Thomson designates as having extra legroom. An extra surcharge may be required to book this seat. 31 H None No Power Seat 31 H is a standard Economy Class seat that Thomson designates as having extra legroom. An extra surcharge may be required to book this seat. 31 J None No Power Seat 31 J is a standard Economy Class seat that Thomson designates as having extra legroom. An extra surcharge may be required to book this seat. 32 A None No Power Seat 32 A is a standard Economy Class seat that Thomson designates as having extra legroom. An extra surcharge may be required to book this seat. 32 B None No Power Seat 32 B is a standard Economy Class seat that Thomson designates as having extra legroom. An extra surcharge may be required to book this seat. 32 C None No Power Seat 32 C is a standard Economy Class seat that Thomson designates as having extra legroom. An extra surcharge may be required to book this seat. 32 D None No Power Seat 32 D is a standard Economy Class seat that Thomson designates as having extra legroom. An extra surcharge may be required to book this seat. 32 E None No Power Seat 32 E is a standard Economy Class seat that Thomson designates as having extra legroom. An extra surcharge may be required to book this seat. 32 F None No Power Seat 32 F is a standard Economy Class seat that Thomson designates as having extra legroom. An extra surcharge may be required to book this seat. 32 G None No Power Seat 32 G is a standard Economy Class seat that Thomson designates as having extra legroom. An extra surcharge may be required to book this seat. 32 H None No Power Seat 32 H is a standard Economy Class seat that Thomson designates as having extra legroom. An extra surcharge may be required to book this seat. 32 J None No Power Seat 32 J is a standard Economy Class seat that Thomson designates as having extra legroom. An extra surcharge may be required to book this seat. 33 D None No Power Seat 33 D is a standard Economy Class seat that Thomson designates as having extra legroom. An extra surcharge may be required to book this seat. 33 E None No Power Seat 33 E is a standard Economy Class seat that Thomson designates as having extra legroom. An extra surcharge may be required to book this seat. 33 F None No Power Seat 33 F is a standard Economy Class seat that Thomson designates as having extra legroom. An extra surcharge may be required to book this seat. 34 D None No Power Seat 34 D is a standard Economy Class seat that Thomson designates as having extra legroom. An extra surcharge may be required to book this seat. 34 E None No Power Seat 34 E is a standard Economy Class seat that Thomson designates as having extra legroom. An extra surcharge may be required to book this seat. 34 F None No Power Seat 34 F is a standard Economy Class seat that Thomson designates as having extra legroom. An extra surcharge may be required to book this seat. 35 D None No Power Seat 35 D is a standard Economy Class seat that Thomson designates as having extra legroom. An extra surcharge may be required to book this seat. 35 E None No Power Seat 35 E is a standard Economy Class seat that Thomson designates as having extra legroom. An extra surcharge may be required to book this seat. 35 F None No Power Seat 35 F is a standard Economy Class seat that Thomson designates as having extra legroom. An extra surcharge may be required to book this seat. 36 D None No Power Seat 36 D is a standard Economy Class seat that Thomson designates as having extra legroom. An extra surcharge may be required to book this seat. 36 E None No Power Seat 36 E is a standard Economy Class seat that Thomson designates as having extra legroom. An extra surcharge may be required to book this seat. 36 F None No Power Seat 36 F is a standard Economy Class seat that Thomson designates as having extra legroom. An extra surcharge may be required to book this seat. 37 A None No Power Seat 37 A is an Economy Class seat that is missing a window. 37 J None No Power Seat 37 J is an Economy Class seat that is missing a window. 39 A None No Power Seat 39 A is an Economy Class seat located in the last row of the plane and may have limited recline. Also, this seat may have a misaligned window. The proximity to the lavatory and galley may be bothersome. You will also be among the last passengers to deplane upon arrival. 39 C None No Power Seat 39 C is an Economy Class seat located in the last row of the plane and may have limited recline. The proximity to the lavatory and galley may be bothersome. You will also be among the last passengers to deplane upon arrival. 39 G None No Power Seat 39 G is an Economy Class seat located in the last row of the plane and may have limited recline. The proximity to the lavatory and galley may be bothersome. You will also be among the last passengers to deplane upon arrival. 39 J None No Power Seat 39 J is an Economy Class seat located in the last row of the plane and may have limited recline. Also, this seat may have a misaligned window. The proximity to the lavatory and galley may be bothersome. You will also be among the last passengers to deplane upon arrival. 40 D None No Power Seat 40 D is an Economy Class seat located in the last row of the plane and may have limited recline. The proximity to the lavatory and galley may be bothersome. You will also be among the last passengers to deplane upon arrival. 40 E None No Power Seat 40 E is an Economy Class seat located in the last row of the plane and may have limited recline. The proximity to the lavatory and galley may be bothersome. You will also be among the last passengers to deplane upon arrival. 40 F None No Power Seat 40 F is an Economy Class seat located in the last row of the plane and may have limited recline. The proximity to the lavatory and galley may be bothersome. You will also be among the last passengers to deplane upon arrival. 6 G None No Power Seat 6 G is a Premium Class seat that may have limited recline due to the wall behind. 6 J None No Power Seat 6 J is a Premium Class seat that may have limited recline due to the wall behind. 7 A None No Power Seat 7 A is a Premium Class seat that is missing a window. The close proximity to the service station behind may be bothersome. 7 C None No Power Seat 7 C is a standard Premium Class seat however, the close proximity to the service station behind may be bothersome. 7 D None No Power Seat 7 D is a standard Premium Class seat however, the close proximity to the service station behind may be bothersome. 7 E None No Power Seat 7 E is a standard Premium Class seat however, the close proximity to the service station behind may be bothersome. 7 F None No Power Seat 7 F is a standard Premium Class seat however, the close proximity to the service station behind may be bothersome. Thomson Airways operates the Boeing 787-8 Dreamliner on long-haul flights with 47 seats of Business Class and 241 seats of Economy Class. The Boeing 787-8 is Boeing's newly launched airliner partially made of composite materials. The 787-8 configuration features LED lighting throughout the aircraft and is equipped with windows 30 percent larger than conventional airplanes and instead of blinds, passengers can use a dimmer switch to control the tint of the window. The bulkhead in front of this seat is cut off about halfway across the seat width. This gives a dogleg and every passing crew member rubs against you. Even more irksome when they have a trolley! These seats on row 10 middle row are great. We always book these which are at a considerable cost. The down side is other passengers wanting to cut through when they realise they are not allowed in the premium section. Well sorry folks we have paid for these seats with extra space , please respect this and walk round. The service we received was very good and the meal far superior to that in Economy. However, the seats adjacent to the toilet aren't the best because of people using the facilities and flushing the loo. Seats very roomy with lots of legroom but need more lumbar support when reclined. Thomas Cook's Premium Economy seats are comfier in my opinion. We had seats 4A and 4C for both flights and were really inpressed. Row 4 benefits from two windows that you have full control over and also a whole overhead bin to yourself. The leg room and seat width are fantastic and even when the person in front reclines there is still plenty of space. You can even still get out of 4a with both 3a and 3c fully reclined and with the person sat in 4c. Service was adequate and in my opinion the price upgrade is proportionate to the extra little things that you get. My only negative comment was the seat could have been a little bit softer, but it was still ok to sit for 10 hours and sleep for a little bit. Just flown to and from cancun from manchester on this plane in these seats. Although neither of us were able to sleep in either direction that isnt the fault of the seating. its very comfortable affording both room seats and plenty of leg room. the footrest doesnt do a lot but im long of limb so suspect those shorter would find it useful! the location of these seats is good being close enough to the loos but not so close as to be constantly disturbed. I also think the allocation of an overhead storage space per seat(s) is excellent. 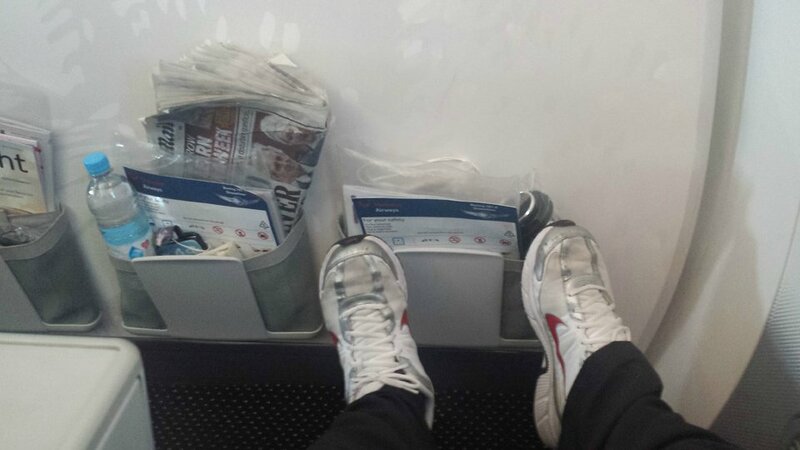 Very good legroom and quick getting off. My partner and I have just flown out from Manchester to Sangster (Jamaica) in the above named seats, and the experience was horrific! We had booked these (and paid) for extra legroom, which you don't get as due to the proximity of the toilets, which means other passengers standing there almost continually and hence encroaching on our leg space. But this wasn't the main problem, which was that the seat width was exactly 17"!! And because of the way these "emergency exit" seats were constructed, with the folding table and display screen having to be folded into the "arms", the seat width was completely constrained to be exactly 17", with no possibility of any extra width anywhere at all. I'm afraid that this meant that both our bums were squashed (left and right) together for TEN hours. Imagine that? This was appallingly uncomfortable, as the only way to get any relief was to sit in a slightly angled position. Sitting in a straight position caused serious discomfort almost immediately. Now, Thomson might respond by saying that the seat width on all other economy seats were also 17", and they are, I measured them, BUT due to the fact that each has at least one ARM with extra space under it, and that arm can be lifted after take-off, that means that in reality all other seats are at least half to one inch wider, which will make all the difference on a long long flight. Seriously, my advice is to AVOID at all costs these seats!! We were in 4G and 4J LGW to Cancun and back. Delightful flights, comfortable spacious seats, easy to get out past sleeping wife, good food, drink and staff. I even slept half the way back. There is a 2nd toilet behind 6G. The only oddity was the poor choice of films but we had tablets so no problem. If you don't want to be bothered by staff in the galley or passengers going to the loo, then don't book theses seats either side. Stay as far away from this seat as you can! Having to use this aircraft as part of a P&O cruise package i allowed my father to book my seat on my behalf after checking the seating plan. I chose this due to the additional legroom, basically, only the exit emergency door in front of me. However, when i saw the position and size of the seat i was horrified. Because of the angle and thickness of the door, you had to literally reverse into the seat and the headroom was diminished too. Indeed, i forgot several times and hit my head as i stood up. No people, there is no warning notice! Also the close proximity to the toilet was horrendous. Outbound flight was better as the cabin crew made at least 4 announcements asking passengers to avoid the middle toilets near row 30 as these people had paid for additional legroom and therefore shouldn't crowd the area. They also drew the curtain across except one cabin crew steward kept on going through leaving it open. Really annoying. Inbound flight there was no announcements and the area in front of 30G H and J was constantly occupied. As was the toilet which had blockage problems on the way out along with a double flush for each passenger!! So much noise. For the first time ever on a flight i did not close my eyes. Finally, the passenger behind me asked me to raise my seat so she could put her wine on her table without it crushing her legs. Last i knew was that the seats could be reclined without affecting the table behind. It appears the dreamliner seats are so snug that this is not practical. The cabin steward did say that she couldn't ask me to put my seat back, it was up to me. 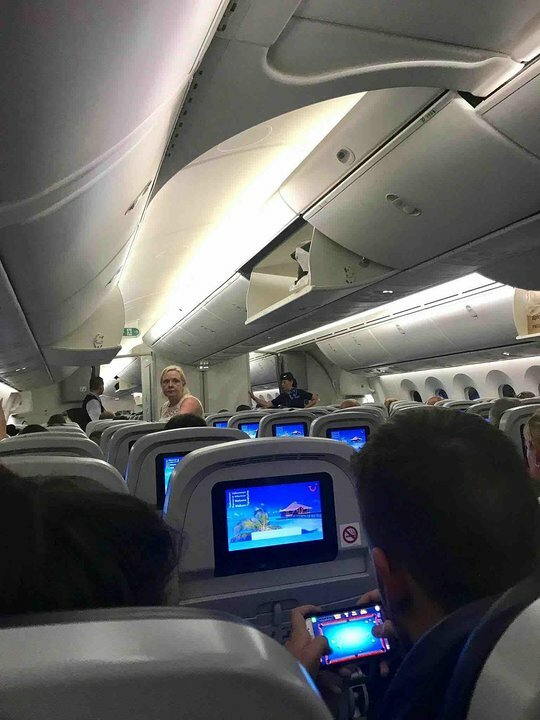 In my opinion 30A and 30J need to be removed and only 2 seats in this area to avoid people crashing into 30G when the entertainment screen is in use. Give it up thomson, stop being greedy and ditch the pitch re the fancy lighting and window dimmers that don't work. The missing window isn't really an issue as there's nothing to see at 37000ft anyway! Flew LGW to MRU. Seat 11A and 11B. Excellent seats, plenty of legroom considering they are standard seats. Quiet as infront of the engines, view out of 2 windows and smooth flight. Would definitely choose these seats again on a future flight. best seats on plane. loads of free leg room. the best seats i thought. Sept/9/2016 Flew home from florida ,premium class,plenty of room,and food much better,than economy,would fly premium again. Comfortable seats,plenty of leg room,these seats are on the wing so a bit restrickted of view,even with two windows . Seats on the long-haul Thomson 787 (not those used on short haul European routes) have extra leg room for seats 30-35 along with the centre three seats on row 36 (36D, 36E and 36F). These seats have ample space, even when the person in front is fully reclined (and I am long-legged 6 foot 3 inches. The seats are slightly narrow, but now painfully so. I disagree about the choice of inflight entertainment. The film choice included modern blockbusters and a number of classic modern blockbusters. Overall, if I travel with Thomson again I would book this seat again. Seat very comfortable, absolutely massive legroom, no entertainment equipment boxes in the way, but TV VERY LIMITED. Nowhere near as much to watch as there is on Virgin. Premium Ok. Seats not as wide and seat pitch less than Virgin premium. Flew short haul from Gatwick to Dubrovnik. Legroom was pitiful, seemed to be worse than most charter/low cost operators (I'm only average height). Return flight was row 33 and had the same experience, plus the window dimmer switch didn't work. Seems a shame that Thomson go to such great lengths to publicise the 787, which is undoubtedly an impressive aircraft, but then ram it full with too many seats. On the plus side, I found it very quiet, especially noticeable on take off. It is hard to reach the window controls. Not as much leg space. Hard to reach window controls. Booked these seats to and from mexico, perfect for a couple, wont be disturbed every 2 mins by the 3rd passenger wanting the toilet or to stretch their legs. even though toilet is behind this wasn't a problem flying to the dominican Republic in September and hope to book the exact same seats. Travelled in seats 1G & 1J in February 2016 between Birmingham (UK) and Jamaica. The seats are large and roomy but were quite hard and I found it difficult to stay comfortable after a while. Also, these seats have a pop-up footrest which, unless you have particularly short legs, is uncomfortable as it ended up behind my calves, letting my feet dangle over the front. Overall, not the most comfortable seat but certainly better than economy. The food was better as well with proper crockery and cutlery. Seats 30 DEF are absolutely fantastic legroom for those very tall passengers. The legroom to the Bulkhead is approximately 44"s. However all of this comes at at a cost in relation to the proximity to the toilet and the fact that passengers seem to think that because of the space available to you, it is also a nice little cut through for them to reach a less busier lavatory. 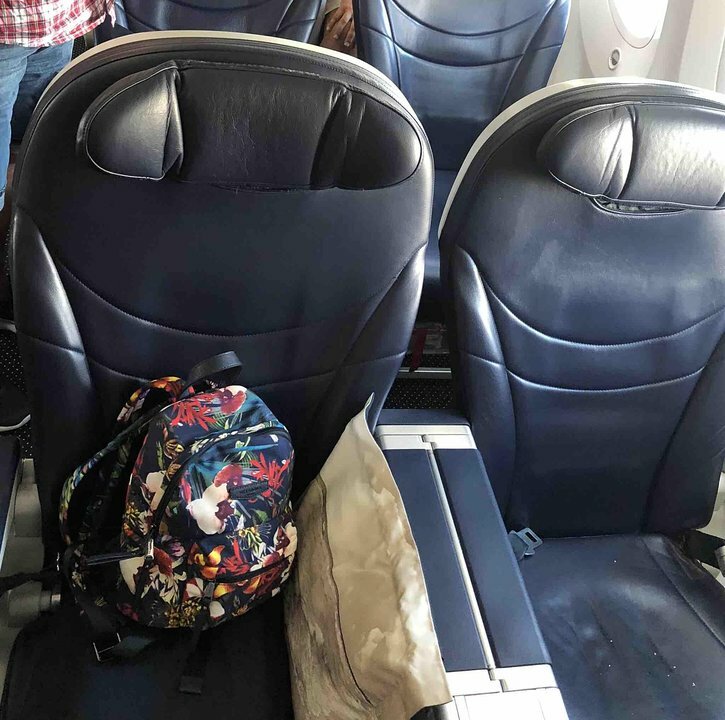 They are not allowed to do this and my advice to passengers in these seats is to put your hand luggage on the floor by your feet to make the route an obstacle not worth tackling. Also on a night flight expect to be disturbed by the constant flushing of the nearby Lavs which are busy throughout. The 787 simply does not have enough Toilets. Flew the Thomson Dreamliner short haul from Malaga to LGW in May 2016. Thought we managed to get a free upgrade to Premium at check in only to discover when boarding that they have reconfigured the plane for short haul routes to the standard 3-3-3 throughout. The front section of the plane where you'd expect to find premium was full of standard economy seats but with an extra couple of inches of leg room. Nice but not what expected. We flew on TUI-F and it seems that this aircraft is short haul only in the summer peak, hopefully be switched back to normal in winter. Not sure if its just this aircraft or a couple of others that have been re-configured. In flight entertainment system did work on the short haul flights but seemed like a limited selection. We flew to barbados and were really impressed at the comfort and service shown to us .The only problem i found was getting in and out of the seat as there was a bit of a squeeze due to lack of room between the seats other than that this was a relaxing flight. The two seats in the center row of three are very good with lots of leg room. We took these seats as all the window seats ( A & B plus G & H had gone. The only drawback in taking any row 2 seats is if any young children or babies are in premium, the will likly be given seats in row 1 which are bulkhead seats. The upgrade to premium is costly but i think it justified, particulary on the flight back to the UK. If we go again, I shall try for either Row 4 A & B or G & H. Finally, I have flown long haul many times on differant aircraft and find this aircraft to be the quietest and most comfortable. Seat does recline and is good to be able to get up and stretch your legs in the space behind without bothering anyone else. No window but not a great loss across Atlantic. Travelled to Cancun in March 2016 on the Dreamliner 787-8 (788). Good seats with plenty of legroom as long as person in front doesn't recline! Service for people in Row 10 to Row 25 was very poor as totally forgotten when it came to providing any sort of drinks, especially water on such a Long haul flight. If you were in Premium you were taken care off. Those in Row 26 to Row 39 went and got their drinks, from the galley, to the extent that captain announced bar was closing early due to nearly running out of drinks. We didn't care about drinks, all we wanted was water and the crew should had looked after all passengers equally. Shame they didn't. Extra leg room seat at extra cost, not worth the extra cost however as the legroom was only 2 inches more than in the standard seats which looked perfectly adequate. My husband being 6ft 4 was too tall for this seat, we had to stop the person in front from reclining as there was no room. This was our first flight on this plane and would look at getting extra legroom on our next trip.Also the hatracks down the middle at this end are taken up with the crews beds above so the is less room for cabin bags. I will not be taking a cabin suitcase next time. They did manage to fit them all in and like the crew says-we are all going the same way so it doesn't matter where they are put.My seat reclined but as the middle arm was broken off my husband had to stay upright,and its not easy to get out when they are in this position infront. Good flight but will be looking for different seats next time. Didn't find the seat comfortable, footrest useless. I'm 6'2", my wife 5'2" and neither of us were comfortable in any position. Main plus is extra legroom, service was good. Air quality supposedly better, hardly noticeable. Was more comfortable in TC prem Economy on A330. Wouldn't rush to book again. I could not fault the service on my 8 hour flight from MAN to PUJ. The cabin crew never stopped the whole time. The food was good and there was plenty to drink. The in flight entertainment is good. There is plenty to keep you occupied and time passed very quickly. I also think that the claim of better air quality has some credibility. I felt better on arrival on both outbound and return flights than I have on medium haul before. The only gripe is that whilst there is plenty of leg room, this appears to be at the expense of seat width. I am not a large person but I found the seats to be narrow. Also, on the return night flight in seat 17J I didn't like the way the windows were automatically blacked out for the whole flight except t/o and landing (and couldn't be adjusted). I take some comfort from being able to see the wing and lights outside. 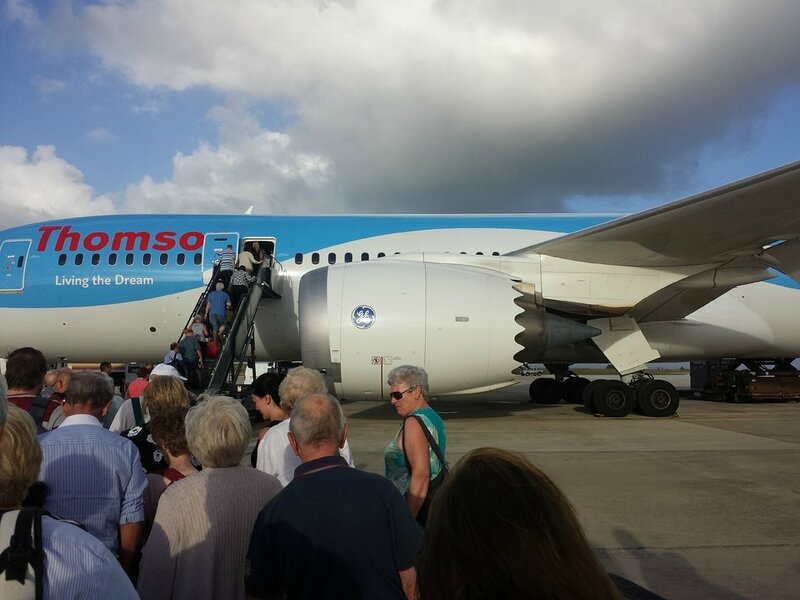 In April 2015 I flew with Thomson to the Caribbean on the Dreamliner. We sat in Premium Economy and both journeys were fantastic. There is tons of legroom and the seats are lovely and wide. The staff are superb and I honestly couldn't recommend the upgrade enough. It's worth every penny. Plenty of legroom but at a cost. Being adjacent to the toilet there is constant human traffic, banging of toilet door ( unavoidable ) and the well known smell and " gush " each time the toilet is flushed.Other passengers exercising and using the space in front as a meeting point is also a big negative. Great seats, great food, great service. Well done Thomson. Lovely flight from manchester to barbados.Excellent service.Bit of a squeeze go get out of seat other than that no complaints whatsoever. Went to florida 17/9/15, very nice plane and mood lighting very calming.leg room was great in economy class,food was OK,but I did feel jet lagged still,overall would like to fly again on dreamliner. Upgraded to this seat from Orlando Florida, Unable to do this on line with Thompsons, But thoroughly reccommend boking Premier cabin, Food, Main course, very good, Breakfast needs looking at. They offer drinks and liquers throughout the the flight, But after dinner you need to ask for liquers, They didn't offer. All in all a great experience. Good seat. You get two windows. These seats must be the most unpopular seats on the aircraft the toilets were permenantly used throughout the 10 hour flight to Cancun and the extra leg room was non existant as every passenger must have stood in the space queing for the toilets !! Never again I will book these seats ! Be warned! 787-neil. Premium 4A & 4C. Plenty of room, food was good. Plane is quieter than others and a smooth flight. Plenty window view. Only down thing is the middle of the seats. A little cumbersome to climb out for the loo. We booked about a fortnight before we flew on March 11th paying for our seats, we were given selected seats with no choice. unfortunately I had 37J which has no window. I felt quite claustrophobic and was disappointed. Impressed with plane and clarity of announcements. Poor seat design making it difficult to get out of this window seat when the seats in the row in front are in the reclined position. I understand Thomsons are in the process of correcting this problem. Very noisy when engines at idle on apron impossible to hear safety briefing, taxiing better, take off very quiet cruise about same as most other modern aircraft,seats ok but no support for back of legs. When seat in front of you in recline position impossible to see TV as it is about 300mm from your face. Suggest safety briefing comes up on the screen as most other Thomson aircraft which is very good. Great seat - plenty of room and space with views out the windows as long as they weren't dimmed. From Gatwick to Puerto Plata: Good seat from my point of view because of the extra legroom. Nobody used that way in between us and the wall. The premium seat are really confortable, and the service is great. There is a a problem in the premium seating department! If you are siting in the window seat the positioning of the tv monitor console in the middle makes it difficult to exit. Even more difficult if the seats in front are reclined. This needs to be addressed urgently! came back from mexico felt great when arrived at gatwick, premium service 10 out of 10only if thomson could get the booking of the seats right, big problem with their web site, so if you want a seat you like good luck. Great seat in the smaller rear section of plane, ideal for window. Plenty of legroom, I'm 6' '2"" ( same with other seats), seat in front reclining does not compromise 'your space'....... there is no need to book extra legroom seats, or Premium for extra room, standard seats are great. Avoid row 37 as it does not align to a window! Excellent leg room and comfort in economy - no problem with recline which is generous - the first time I have been comfortable long haul - the 8 & 10 hour flights went quickly and extra oxygen in the air made a real difference. Seat 39J is a great seat for couples. There is less recline due to the toilet wall behind but it is still more than you would normally get anyway and more than comfortable. You get the benefit of 3 trays for 2 seats and extra space to the right of the seats where the gap is. You don't get disturbed by the toilet or galley activitey. 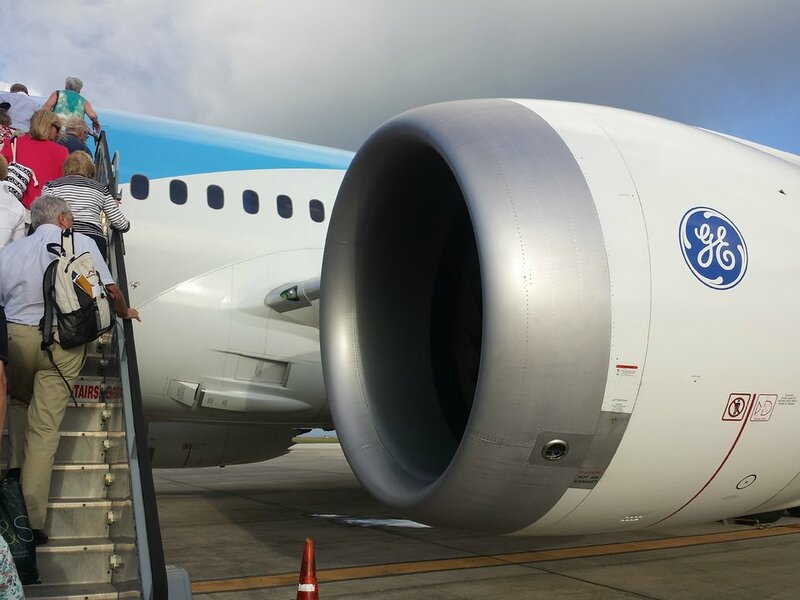 Thomson flies 1 versions of Boeing 787-8 (788).